This is a Little Bit salad because I made it by adding a little bit of this and a little bit of that until I liked it. We had a BUNCH of quinoa, which we had flavored with cumin, left over from another dish, so I started with that. I peeled two mandarin oranges, cut them sideways in half, and pulled the pieces of one of them apart. 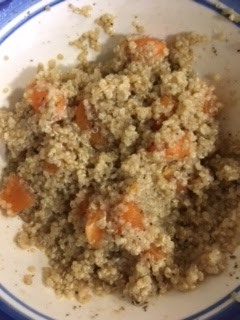 I squeezed the juice out of the other one into the quinoa. I added a little bit of mint, a little bit of cardamom, a little bit of lemon juice, a little bit of olive oil, a little bit of salt, and a little bit of honey. I loved it, and so did #4 Daughter, the amazing Sara Marian. Charlie was Meh. He usually is.